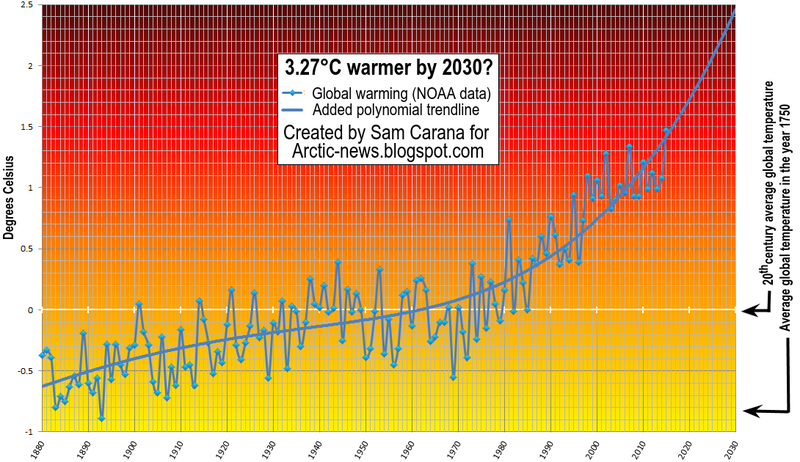 Arctic News: 3.27°C warmer by 2030? 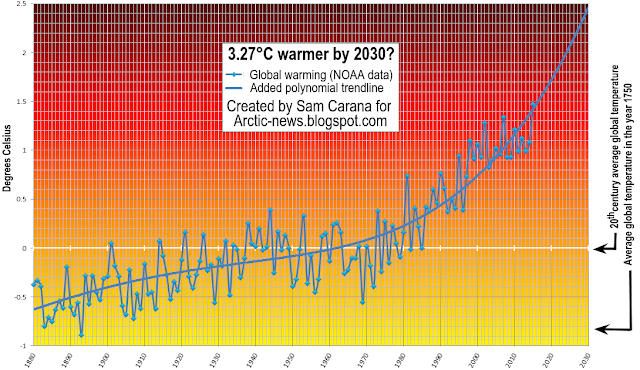 Will it be 3.27°C warmer by the year 2030? In December 2015, world delegates will descend on Paris to ensure that global warming will not cross the guardrail of 2°C above pre-industrial levels. In a way, we have already crossed this guardrail. 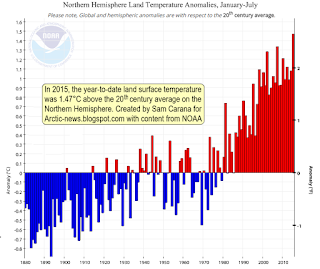 NOAA data show that the year-to-date land surface temperature was 1.47°C above the 20th century average on the Northern Hemisphere in 2015, as illustrated by the image on the right. Granted, there was less warming on the Southern Hemisphere, so the globally-averaged land surface temperature was a little bit lower, i.e. 1.34°C above the 20th century average. For reference, the image below on the right gives an overview of mean 1901-2000 temperatures. Anyway, the difference between hemispheres is small and not very relevant since most people live on the Northern Hemisphere. More importantly, this 1.47°C rise is a rise compared to the 20th century average. The 20th century average was some 0.60°C higher than temperatures were at the start of the NOAA record in 1880. 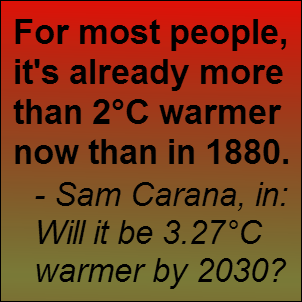 In other words, temperatures for most people on Earth are already 2.07°C higher than they were in 1880. Furthermore, between 1750 and 1880 the global average temperature had already increased by some 0.20°C. Sure, 2015 is an El Niño year, but this El Niño is still strengthening, so 2016 could well be even warmer. 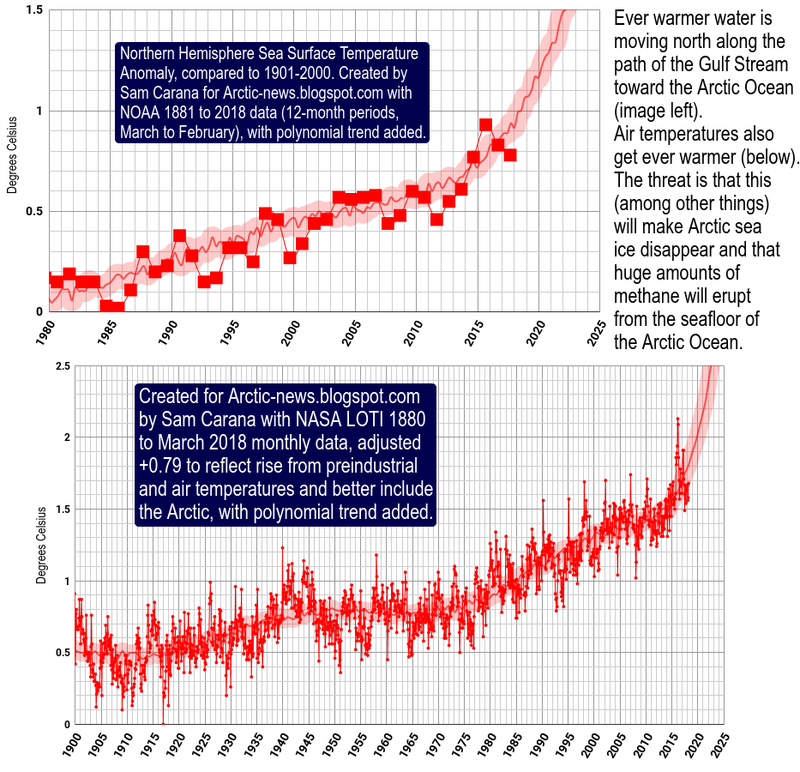 Moreover, recent temperatures are in line with expectations of a polynomial trendline that is based on these NOAA data and that points at yet another degree Celsius rise by 2030, on top of the current level, as illustrated by the top image. Altogether, this would make it 3.27°C warmer than in 1750 for most people on Earth by the year 2030. So, instead of acting as if dangerous global warming could possibly eventuate beyond the year 2100, delegates in Paris should commit to lowering temperatures, starting now. To lower temperatures, cutting emissions alone will not be enough. Stopping all emissions by people would make that the aerosols that are currently sent up in the air by burning fuel and that are currently masking the full impact of global warming, will fall out of the air in a matter of weeks. Until now, about half of the global temperature rise is suppressed by such aerosols. Stopping aerosols release overnight could make temperatures rise abruptly by 1.20°C in a matter of weeks. Furthermore, carbon dioxide that is emitted now will take ten years to reach its peak impact, so we're still awaiting the full wrath of carbon dioxide emitted over the past decade. A recent study calculates that global mean surface temperature may increase by 0.50°C after carbon emissions are stopped, and they will decrease only minimally from that level for the next 10,000 years. Removing carbon dioxide from the atmosphere would not work fast enough to avoid further warming and acidification of the oceans. 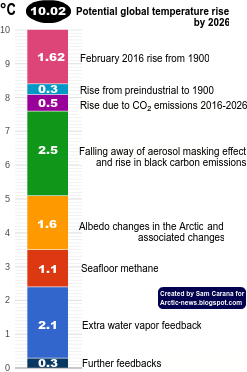 In fact, temperatures look set to rise even faster as feedbacks start to kick in more fully, such as albedo changes due to decline of the snow and ice cover in the Arctic and methane releases from the Arctic Ocean seafloor. Furthermore, water vapor will increase by 7% for every 1°C warming. Water vapor is one of the strongest greenhouse gases, so increasing water vapor will further contribute to a non-linear temperature rise. In conclusion, the world needs to commit to comprehensive and effective action that includes both emission cuts and removal of greenhouse gases from the atmosphere and oceans, as well as further action to deal with the dire situation in the Arctic, as discussed at the Arctic-news Blog. I still didn't get a reply from David Spratt, even on FB... I hope I get it soon, or I might decide to post it anyhow, the most important thing in my view is to get the messages out there. Have a nice day and thanks again for your work. Sure, look forward to see french version of this post on your blog, thanks. I'm not sure if you got my previous comment, they sometimes seem to get lost. "The 20thcentury average was some 0.60°C higher"
and not above the 20th century average. Jack, I've added an image with content from the NOAA page, including the note that hemispheric anomalies are with respect to the 20th century average. Where did you read that this was not the case? The blue-colored bars on the mage with the NOAA show how much temperatures were below the 20thcentury average. For the year 1880, it was -0.39°C, while for 1883 it was -0.68°C and for 1885 it was -0.72°C. The top image adds a trendline for all years on record, showing a difference from the start of the record in 1880 to the 20thcentury average of about -0.60°C. Could you please let me know if I'm correct? That figure doesn't look right to me. I've added figures for the mean temperatures 1901-2000, which shouldn't be too different from the 1910-2000 average. 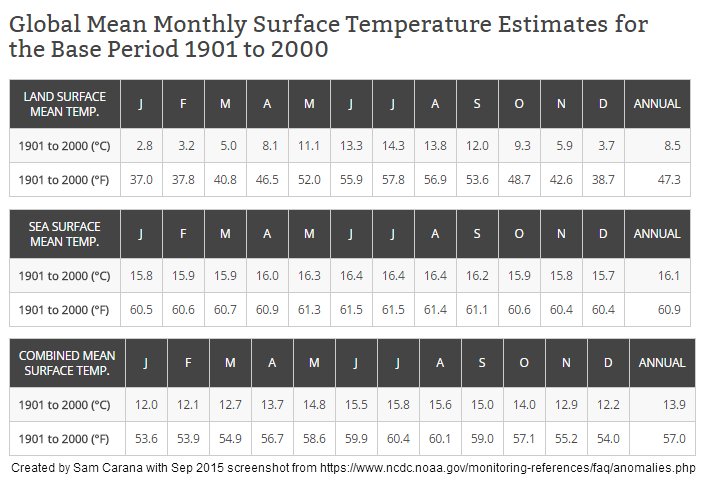 The NOAA data show 2015 YTD as +1.45C above the 20th century average, not 1.47C. A small discrepancy. I don't see where the 0.6C figure comes from. Firstly, the average anomaly for the year 1880 is about -0.49 (so 0.49C colder than the 20th century average). So that isn't -0.6C. However, one year is noise. The average for 1880 to 1899, incl. is about -0.46C, though this probably still isn't statistically valid. 30 years seems to be generally reckoned as the period needed to figure climate for a period, so we probably need 1865-1895 data to get a good idea of how much it warmed from 1880 to the 20th century average, but I'm still not sure that would be statistically valid. Certainly this year is a hot one, globally or hemispherically, land or sea. But I'm not sure if we can say that it's reached the magic figure of 2C already, particularly as that wouldn't be for the global surface temp (which is what matters) and wouldn't take into account natural variation, which is part of what we've got at the moment (with El Nino). Yeah, NOAA reanalyzes data all the time, which can result in small adjustments like that. At the time of writing the post, the anomaly was 1.47°C above the 20th century average. The -0.60°C departure from the 20th century average is the temperature at the start of a polynomial trendline on the 1880-2015 dataset, as illustrated in the top image. Sure, weather changes from day to day, but variability works both ways, it can either raise or decrease temperatures, and while 2015 is an El Niño year, this El Niño is still strengthening, so 2016 could well be even warmer. Moreover, higher temperatures are in line with expectations of the polynomial trendline in the top image and it points at yet another degree Celsius rise by 2030, on top of the current level. The post also comments on the difference between hemispheres, explaining that, while there was indeed less warming on the Southern Hemisphere, the difference between hemispheres was small. Globally-averaged land surface temperature was a little bit lower, i.e. 1.34°C above the 20th century average (or 1.32°C in the new reanalysis). As said, this difference is not very relevant since most people live on the Northern Hemisphere, so for most people it's now already well over 1.4°C warmer than the 20th century average and more than 2°C warmer than it was in 1880. I look at this issue and see that California is becoming a wasteland through fire and drought. People leaving California are not coming, they are as much refugees as the ones in the MENA region. It is more evident that the main feedbacks are becoming stronger, as shown by the increase in temperature at Greenland. There are zones where the anomalies range from 5-10 degrees. Its is extremely dangerous. Bering Straight newspaper just reported that the Polarled pipeline just crossed the Arctic Circle, making clear that humans are there to stay and to develop what they consider cheap energy. It will be the most expensive energy in the world, since it will trigger its collapse. Again, thanks for your great work and help.